Last Thursday, I drove the shadow over to my favourite mustang specialty shop for some dyno testing. The first run was set at 30 psi boost and a 70hp jet of nitrous. The clutch slipped like crazy, no impressive numbers.The second run was made with boost alone. 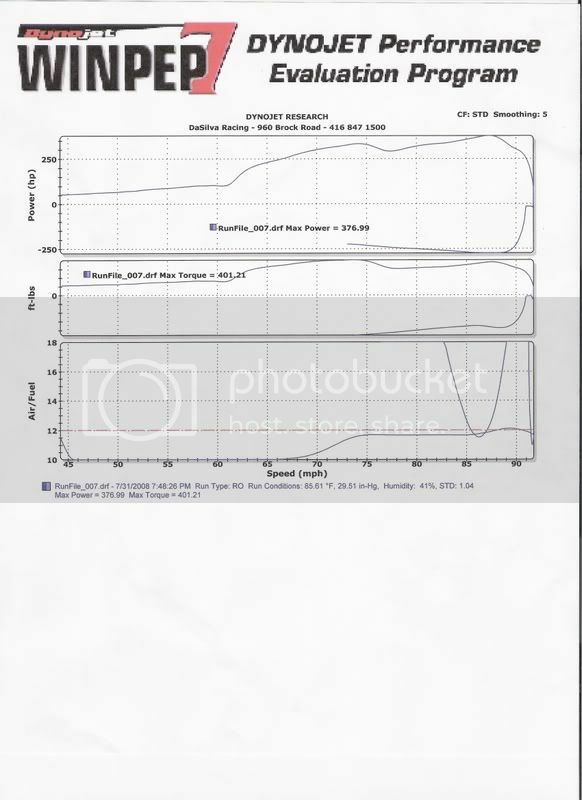 298whp with 344wtq with 25 psi boost 8 degrees timing and the stock 2 bar cal. . We gave it some cool down time for the clutches' sake and tried the last pull with the 50hp jet to try to give the clutch a chance to grip. 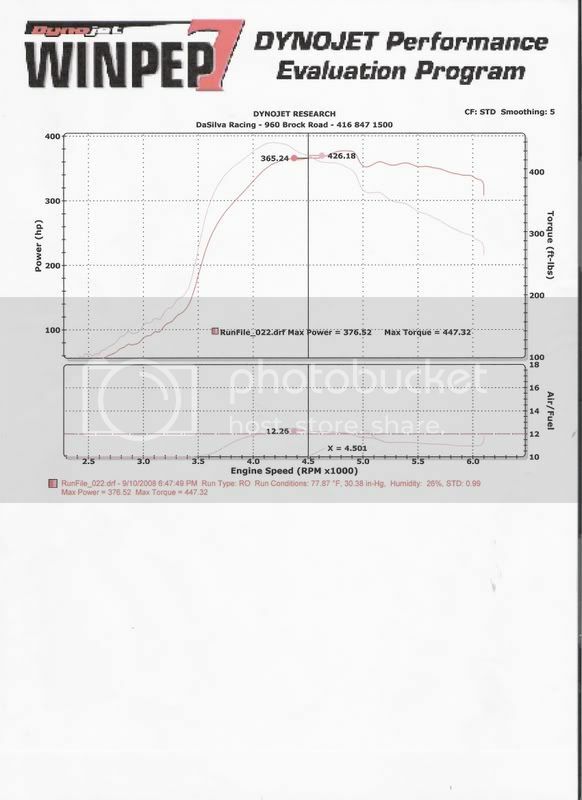 Boost went to 28 psi and the run was cut short due to the slipping clutch. This nitrous stuff is great fun and hazzardous to my clutch and front tires. Have you put a new clutch in the car since I read about it slipping last? I am assuming you haven't otherwise I would imagine that there would be swearing involved. Nice numbers for that boost level with your setup for sure. You are running a TBI header correct? Were these runs with race gas? Same rev-lok clutch. I should have a new one ordered by the end of today. I wanted to have an idea of the torque the engine made so a better clutch selection could be made this time. TBI header and pump 94. I was thrilled to see over 400 wtq. I bet there's 400 whp in it with a proper clutch. I bet you're right. Keep up the good work. I can't wait to see some new times with the new clutch. What did you decide on by the way? I'm honestly waiting for Chris to add them to his website so I can order them. The place near me was less than helpful with clutch selection. Interesting. It is the worst when local guys won't help you out. It was the best when I worked a couple blocks away from a hydraulic supply place. I got all my lines and fittings for next to nothing, and no shipping to boot. Those were the days. Looks like the engine likes the nitrous alot more than the clutch does!! Hopefully you dont use the stock plate that comes with the revlok when you get your new clutch. It is the worst when local guys won't help you out. Thats the worst, because honestly 9 times out of 10 you can buy stuff online cheaper but have to wait. Seems they'd bend over backwards to earn your business. Nice numbers on the car. Shadow 88. Nice pulls! Now get a fricken clutch! Thank you, thank you. According to Chris @TU the clutch should be here any moment. He said he'll e-mail shipping and tracking info this evening. I'm buying and testing (lab rat style) TU's new purple pressure plate and 4 puck ceramic disc. Chris tells me I should be the first to have one installed, and I will, as soon as it gets here. I already have a freshly machined flywheel waiting at work and a hybrid 520/555 transmission built by Dave Rose waiting and ready to go. Mike, the engine and I both are HUGE fans of the nitrous. Driveline failures be damned, this stuff's a hoot. nitrous. Driveline failures be damned, this stuff's a hoot. That's great! The challenge will be to keep it to a HP level that the parts can handle, seems like we find ourselves wanting to put "the big jets" in "just once to try and touch a ___sec time", DON'T DO IT! Too much is too much no matter if it's only one time (and it wouldn't be! ). I say this more as a warning to others, I know you're pretty conservative with the nitrous. Have you received the purple plate yet? If so, what do you think of it? I have one on order with a 6 puck ceramic disc and am hoping it will handle at least 450lb-ft of torque. If your new clutch doesn't hold for you, I'll have to think of something else to use! Clutch arrived last week while I was on holidays. I'll be installing it this weekend. Once it's broken in, you'll all know about it. I'll keep you all and Chris in touch, I'll just keep this thread going rather than starting a new one. My clutch is scheduled to be delivered tomorrow, so it looks like we'll both have the purple plate in testing around the same time. I'm curious to see how our opinions differ. HOW do you keep your EGTS down with a stock computer? Last edited by 1BADVAN; 09-10-2008 at 05:16 PM. Yes 8* BTDC base timing. Running pump 94. Lots of other mods, DIY manifolds, hybrid turbo, super 60 cam, fmic, really, lots. This purple plate and 4 puck ceramic from TU really did the trick! Thanks Chris! That is some serious action. Congratulations. Dyno day in New york. By CSXT802 in forum Events, Racing, & Results! By crazymadbastard in forum Events, Racing, & Results!